That was the call I heard as my mother and I waited in line to board the Skunk Train in Willits, California. We all shuffle along, waiting our turn to hand our ticket to the guy, dressed in a train engineer’s garb,waiting at the doorway of the train car where we are to climb aboard. An old classic California Western train, with two covered passenger cars and an open viewing car sandwiched between, is where we are all to go. A reasonably large group of kids climb aboard with expressions ranging from boredom to expected adventure on their faces. In the mix of people is a mustachioed fella dressed as a train conductor who stands out! I figure he is an employee dressed as the part – and perhaps he is – but as it turns out, he is MUCH, much more! We don’t know how much more as the train begins its journey. We are taking the day tour up to Northspur for lunch. It’s a tour through the grand Redwoods of Northern California. I’m ready for an amazing photo opportunity, riding this train. Taking tickets and helping us board…. Introductions and safety spiel delivered by this guy dressed as a train engineer! As we trundle up the mountain, I snap away at whatever catches my attention: a verdant meadow, old decaying buildings that once supported the train line along these tracks in the days of yore, brooks and streams, and even a tunnel! Touching the boughs as we go! All the while, the man in the conductor’s outfit is mingling with the other travelers. There is something very special about this guy. Is it the handle-bar mustache? Perhaps it’s that joyful twinkle in his eye! The outfit is a no-brainer but there is something more…So, I introduce myself, offer my business and we chat. I learn his name is Greg Schindel and he’s not an actual “employee” of the Skunk Train at all but the Train Singer! He rides these trains out of Willits and Fort Bragg, entertaining everyone who rides the trains singing old traditional train songs like “The Orange Blossom Special” (one of my requests), “Dinah Won’t You Blow” and even a ballad he wrote called the “Dreamline Express.” He has been doing this for about twenty six years! About half-way up the mountain, I find him surrounded by a group of smiling and enchanted kids as he strums his guitar and sings old favorite train songs to them. It’s not just what he is singing but how he sings the songs; with great passion, exuberance and expression! There is also a harmonica bar positioned in front of his face and, from time to time, depending on the key, he pulls out a harmonica to play, as well! 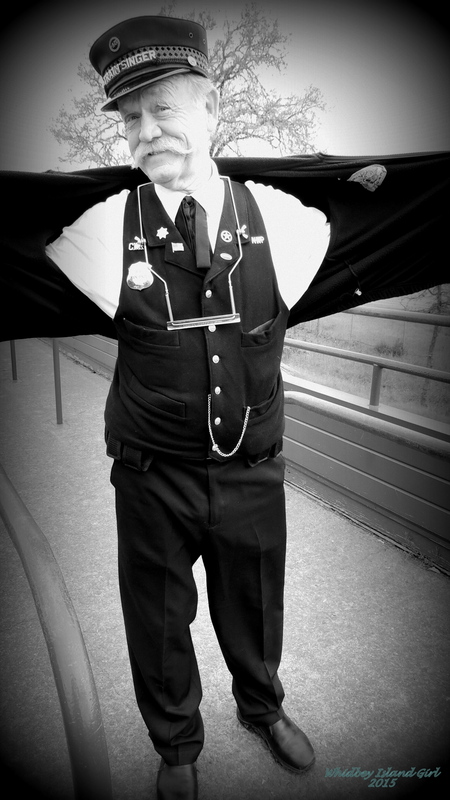 He does train whistles, emulates the sounds of the trains wheels over the tracks and so much more! I’m enthralled at the way he captivates his audience! He sings with such joy and passion! It’s simply infectious! At Northspur, we all disembark for lunch. There is a little train camp set up, complete with grills, picnic tables and cooks to prepare whatever is available on the menu. I had the grilled chicken sandwich. In the meantime, Greg appears, mingling through the tables with a squeeze box in his hand playing more requested songs! Later, I find him playing the auto-harp, as well! He’s a one-man-band! The Train Camp we stopped at in North Spur for lunch! Order a dog; they squeak the chicken! I literally laid on the forrest floor to shoot this! He played the Orange Blossom Special for me! Back aboard the train, on the return route to Willits, he continues to mesmerize us all with his music! My mother bought a CD of his songs for her and myself, along with a signed book titled “Dreamline Express.” He also has a website called http://www.trainsinger.com where anyone can learn about Greg and check out his CDs. For this road trip to Mendocino, Greg Schindel is my Most Memorable Person of the trip! ← The Jellies of Glass Fire! Thanks! I’d be happy too! I’ve had my blog for two years, now. I don’t consider myself that experienced – so, you flatter me! – but I am always open to learn more and because I am interested in how all this goes together, I’m teaching and practicing HTML code in it. I’m going through my old posts and tweaking their fonts, sizes and styles to be more attention grabbing. I’ve also finally expanded my social media accounts to reach larger reading audiences. I’m learning to make this something folks enjoy reading. I’ll take a look. Today is your day! I’ve nominated you for the Blogger Recognition Award. Visit me again to learn what to do next! Congratulations!